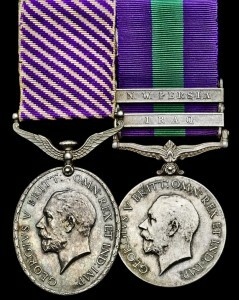 The Distinguished Flying Medal (DFM) was instituted by Royal Warrant on 3 June 1918 and was awarded to non-commissioned officers and men of the Royal Air Force for ‘an act or acts of valour, courage or devotion to duty performed whilst flying in active operations against the enemy’. 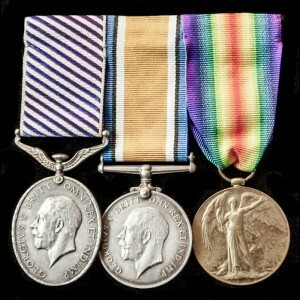 Issued to just 104 recipients during World War One, the DFM was the equivalent of the Military Medal (MM) for acts of valour on land, the Distinguished Service Medal (DSM) for acts of valour at sea, and the Air Force Medal (AFM). 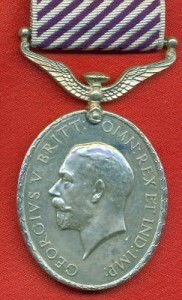 A Bar to the medal, featuring a centralised eagle, was also available to recognise further acts of bravery. 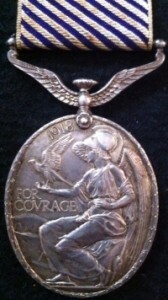 The DFM is cast from solid silver and has an oval design with King George V’s effigy on the obverse and a representation of Athena Nike seated in an aircraft, a hawk rising from her right hand, and below, the words ‘FOR COURAGE’, on its reverse. 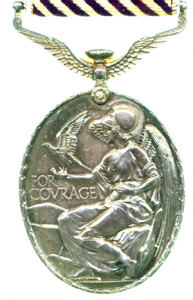 The medal is surmounted by a bomb attached to the clasp and ribbon by two wings. The ribbon, which is 32mm wide, has alternate diagonal stripes of violet and white, each 1.5mm wide, which run at an angle of 45 degrees from left to right. The medal was engraved with the individual’s service number, rank and name, and holders who won two bars were automatically awarded the Distinguished Service Order (DSO) and the Air Force Medal (AFM). All recipients of the medal were entitled to use the letters DFM after their name..